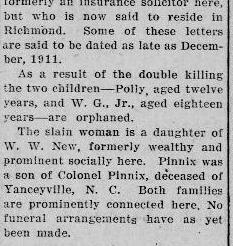 I stumbled upon the tragic story behind the deaths of William and Fannie New Pinnix while researching Fannie’s siblings, who died of various diseases while very young. 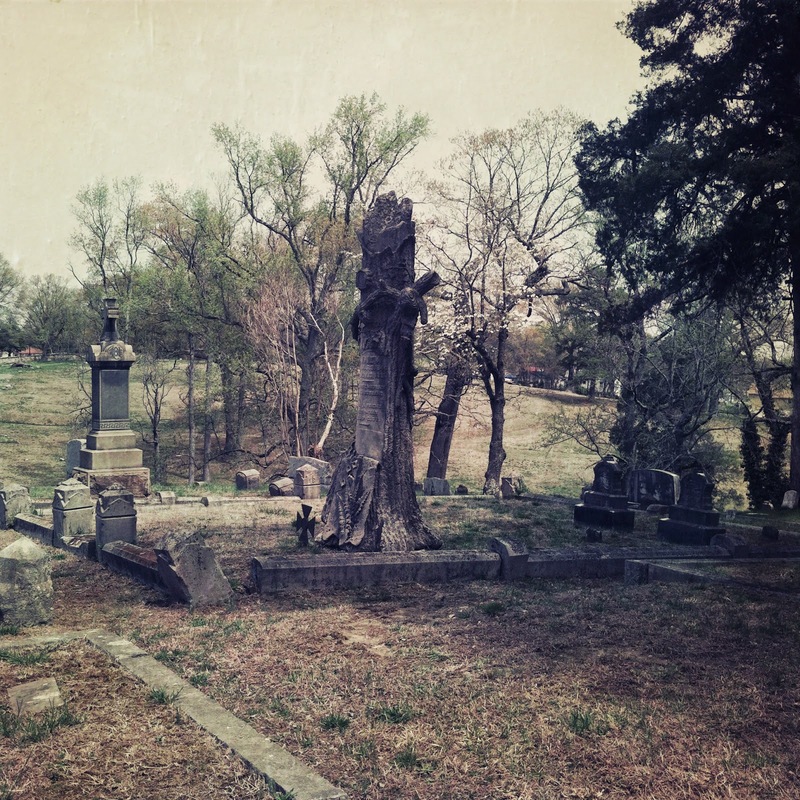 Looking at the burial ledger for Green Hill Cemetery during the month of December 1911 when William and Fannie died, there are two entries for names that look like “Pinnix” who were buried in the New family square. When I went back to the cemetery though there were no markers in the square for anyone except Charles and Maggie New (the two siblings) and Fannie’s father, William. 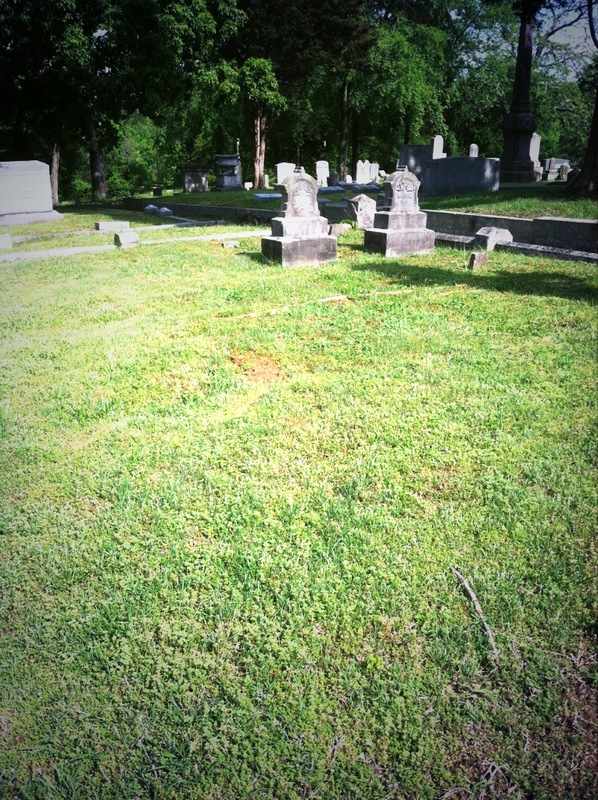 Unless their bodies were moved and re-interred elsewhere, I believe this to be the area where they lie today in unmarked graves. 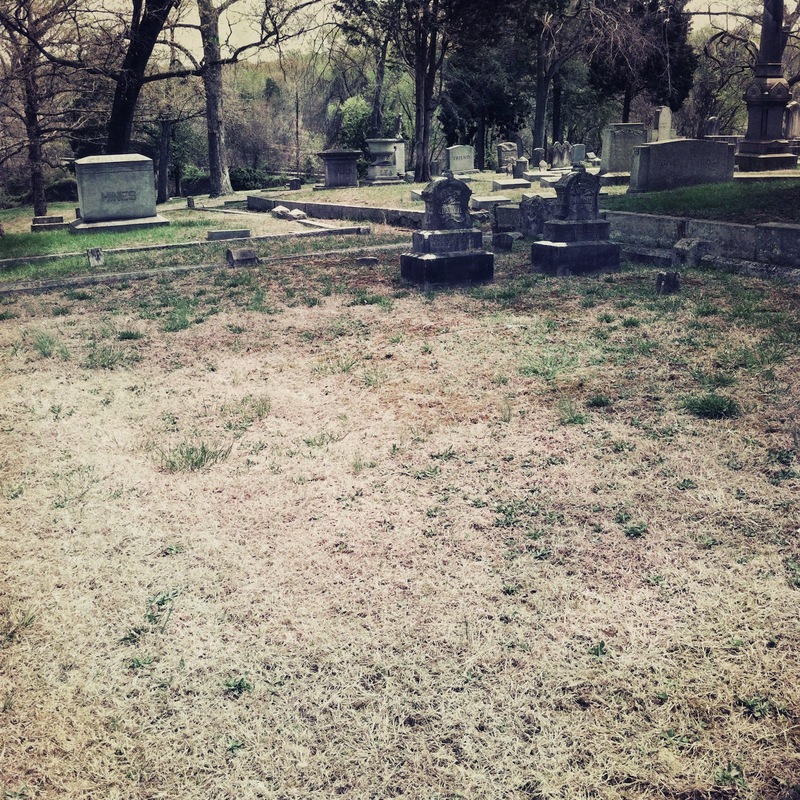 (Whether the graves ever had markers, I don’t know.) There is plenty of room in the plot for more burials and the depressions in the ground could indicate more graves. According to the 1910 census, William Pinnix and Fannie married in 1894. Since then they’d had two children: William, who was 15, and Reamey, 9. (Reamey may’ve been called “Polly.”) The family was living on Lee Street, William (the father) employed as a railroad clerk and the teenaged son employed as a roller at a cigar factory. There may have been a cook in the home with a young child, although whether she was working for the Pinnixes or if she was a boarder, I’m not sure. On paper, everything seems fairly normal and maybe even “good” for an early 1900s family: both parents were living in the home, the father had a job, and they possibly had a domestic to assist with the running of the household. Then on December 13, 1911, the storm that had been brewing in the family unit resulted in a violent tempest that would end two lives and forever change at least two others. At around 2 p.m. that afternoon William gave his son a box with instructions that it be delivered to a friend, stressing the importance of the package’s contents. Two hours later William Jr. was in the bedroom next to his parents’ quarters when he heard gunshots. He ran into his parents’ room to find that his father had shot his mother twice on the right side of her head, one bullet through her cheek and another through her temple. William Sr.’s final shot was through his own temple. Both of them died shortly afterwards. The articles discussed here suggest that the Pinnix’s marital troubles weren’t so secret. There were rumors that Fannie had left her husband on several occasions and that close to the time of the murder-suicide William had been ill and drinking heavily. Whether his illness was depression and “prostration” over his marital problems wasn’t mentioned but that would make sense. The box that he’d given William Jr. contained clues as to what drove him to commit such an extreme, horrendous act, which he may’ve been planning since the end of November. Inside the package were letters allegedly written by A. Bridges to Fannie which suggested that the two had been having an affair, with some correspondence as current as month of the slaying. Bridges was a Richmond insurance agent who used to live in Danville. Of course with only the few details listed in the papers, we can only guess what was going on in the Pinnix household in late 1911. Had William Sr. just discovered the affair in November? When did Fannie leave the family and how long was she gone? Where did go? Why did she return? What made William Sr. not only kill himself and his wife, but carry out the act with at least one child in the house to witness the aftermath? The environment prior to the killings must have been extremely tense for everyone, especially William Jr. and Reamey. Their mother’s indiscretion combined with their father’s drinking makes it likely that tempers flared between the couple as they tried to deal with the consequences of and the pain caused by the affair. Being so close to the holidays, I wonder if anyone had put up a tree or done any decorating around the home. I can’t imagine that the mood was festive. These articles seem to have listed incorrect ages for the children. William Gunn New Pinnix was born in 1895 and Reamey in 1901, making the son around 16 and the daughter around 10 when they were orphaned. Where they lived directly following their parents’ deaths is a mystery. William Jr. went on to marry, have children, and live in various parts of the country, including New Jersey. While he was married to Helen Johnson Pinnix in 1930, by 1940 they were divorced. I haven’t been able to find out anything else concrete about Reamey. It would be interesting to learn how the two handled their parents’ violent deaths and what the impact of those deaths was on their emotional well-being and future relationships.